The definitions listed below are why I think most people’s troubles come from insecurity, and not ego like many spiritual gurus state. 1. A person’s sense of self-esteem or self-importance. 2. The part of the mind that mediates between the conscious and the unconscious and is responsible for reality testing and a sense of personal identity. 3. An overly high opinion of oneself. The third definition of ego comes from insecurity. But it is a false sense of ego used to overlook our fears and insecurities and help us feel better about ourselves. I should know. I had a false ego all through my life—even into my early sobriety. It was in my sobriety, however, that I was able to become more self-confident and grow to love myself. I also found greater happiness in life. Especially after finally becoming happy with who I was. It is those things that I want for others. It’s why I do what I do to help people. I enjoy helping others. It makes me feel good about myself, and gives me a sense of achievement. Not because of ego. And not because of insecurity. But because of who I’ve become. 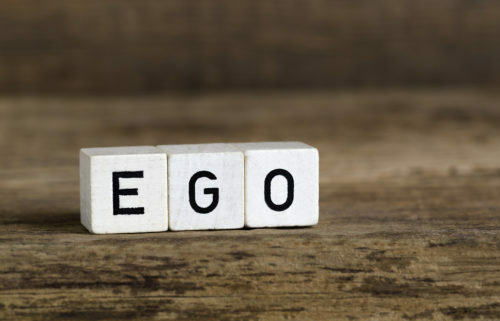 Does Your Ego Have It Right? Because of my fears and insecurities, I can remember feeling less than for a good part of my life and it was one of the reasons why I liked to drink so much. When I was drunk I could be whoever I wanted to be, and act however I wanted to act, without feeling the way I did when I was sober. This was only a temporary fix, though, and it would take several years of sobriety and a lot of growth before I became more secure and confident in myself. Becoming more secure and self-confident helped me to stop feeling less than, and as I continued to grow, I would eventually love myself enough to be happy with who I was. But it would be the realization that we’re actually not all equal and that, in fact, some people are better than us that would help me see how much I had grown. I should probably explain this with a story. When I was younger I never liked losing at anything, and I actually got mad when I did. Getting angry when I lost at something continued into my adulthood and I hated even losing a simple card game. Much of this stemmed from the fact that I had to believe I was better than someone else to feel good about myself, and although drinking helped me feel that way, the reality was that it also prevented me from growing up emotionally. I basically remained the same fearful and insecure person I was when I started drinking at sixteen. Like many people who begin drinking and taking drugs at a young age it stunted my emotional growth. And even with all the life experiences I had over the years, by the time I finally stopped drinking at the age of thirty-six, I hadn’t matured much emotionally. This lack of emotional maturity was also responsible for other negative emotions I felt. (Worry, sadness, and even self-pity were a common part of my life.) But make no mistake about it, my fears and insecurities were at the heart of these emotions and, as I said, the reason for feeling less than. However, as I kept growing, so did the love I felt for myself and others, and I eventually no longer needed to be better than someone else. It was at this point in my sobriety that I knew I had reached a level of growth that I never experienced before, which was quite gratifying for me considering my past, and it made me feel even better about myself. When we are able to take a look at ourselves with confidence and love for who we are, it no longer bothers us that some people are smarter than we are, more skillful at their jobs than us, or more talented at things like singing, acting, and playing sports. And there are also those who are funnier than us. (Even though I pride myself on being a funny guy, I know people who are funnier than me, and I love it). Besides the things I just mentioned, certain factors can play a huge role in how equal we are to someone else. Statistics show that who our parents are and where we’re born have a lot to do with how successful we become, and despite the rich problem child we occasionally hear about being born into a wealthy family with social status certainly gives many people an advantage in life. The trick is to not let others make us feel like we’re less than simply because they have more money or some perceived social status, or even if they have a higher education and a title of some kind. This takes a lot of growth on our part, and we may need help overcoming any fears and insecurities we have, but I know it can be done. But maybe it is in what we call death that we are recreated as spirits or souls and find that there really is something that created life and the universe for a reason, and that this creator loves us all equally. Whether we’re aware of it or not, there are different levels of things we experience both in life and as a person. For instance. There are different levels of wealth or debt we occur. Different levels of happiness we experience. Different levels of love we feel for people. Different levels of faith one can have. And for the sake of this writing, there are different levels of confidence we can have in ourselves. For some of us, it takes time and different experiences to grow more self-confident, and there are occasions when we need to talk to someone when we have doubts in our lives. Doing so can help us uncover any underlying fears and insecurities we may have and better understand why we have them. I have a lot of confidence in myself these days, but it certainly doesn’t mean I’m more confident than some of you reading this, or that I’m completely free of insecurity. But I know that as long as I’m willing to learn from certain things I go through, and use what I learn to improve on myself, my confidence will continue to grow. One of the more recent experiences that helped me reach a higher level of self-confidence was going to college. I first dreamed of going back to school in 2003, and although I would get quite an education through helping people with addictions and counseling teenagers, I still always wanted to attend college someday. I believe education can add to our personal growth, and when circumstances came into play that would allow me to obtain an associate degree in drug and alcohol counseling, I was excited for the opportunity. I must admit, though, that while I thought I already knew a lot about counseling and addiction, I would learn many more things, and I would also learn more about myself. I really enjoyed going to college. In some ways it reminded me of when I was in high school. Just like back then, I would often display a sense of humor in the classroom and have fun with some of the teachers. Besides being the funny guy at times, I also participated in discussions we had in some of the classes. I liked sharing my thoughts on whatever the topic was, and I could be quite passionate about it at times. Most people didn’t seem to mind, and a few would say they liked what I shared, which made me feel good, but I could tell a few of them didn’t care about my views. I just wrote it off as thinking they just didn’t get me, but something would happen later that year to help me begin to see that there may be something more to my active participation than just passion and enthusiasm. In one of my classes during the last semester, just after one of my soap box exhibitions about something I don’t even remember now, someone sarcastically joked about me going on for so long and a young lady, who was actually defending me, spoke up and said. “He just has a lot to say.” Everyone laughed, including me and the teacher, but it opened my eyes to the fact that I had been feeling a very strong need to share my views all the time. A lot of what I had to say came from the passion I felt about helping others, and participating in class seemed like the perfect outlet for it. But after that day, I made it a point to try to show more restraint in sharing my views and I often sat quietly while others shared theirs. In my second year, although I continued to show restraint in most discussions, something began changing inside of me, and by the fall of that year I knew there was something else than just a passion that fueled my need to share the wisdom I thought I possessed. During that semester, I didn’t always agree with some of the things we talked about in class or with certain things I read in some of the books we used on addiction. Much of what we discussed from these books had to do with stereotypical alcoholics and addicts, and I felt the class needed to hear more about people like me who didn’t drink everyday, but still had a problem. I was also proud of the knowledge I had obtained from working with people with addictions and it frustrated me when I felt some of my views weren’t being taken seriously. This wasn’t actually the case, as I knew some of the students liked and trusted what I had to say, but it’s how I allowed myself to feel at times. Fortunately, though, as the semester progressed I would realize what was actually making me feel the way I did. I had begun having doubts earlier that year about some of my personal views on counseling and addiction and I let it affect my self-confidence. I also felt like my identity was slipping away and I no longer felt as good about myself as I once did. The good news, though, was that I fought these insecurities and I was determined to emerge with what I would later call a quiet confidence. One where I didn’t feel the need to have all the answers and could simply sit back and let others share their views. Finally, as the semester was coming to an end, I began exhibiting this new-found confidence and it felt good knowing that once again self-awareness and my drive to grow had paid off. I left school with more knowledge than I had before and I was now able to show more confidence in my personal life as well. A quiet confidence where I no longer feel the need to have all the answers, and I’m able to sit back and listen to what others have to say in life.